So, I finally named my 4th of July paper doll with Mary’s suggestion, Hazel. I thought Hazel was a vintage sounding name to go with a vintage inspired set of costumes. I rather like how she turned out and I think her dresses are all very pretty. In my mind, Hazel is of African descent and is perhaps from London (though that would make her celebrating the 4th of July a little wierd). Random Rachel Story Time: When I was traveling around the UK in college, I spent several days in Newcastle hanging out with two wonderful girls from London who were both British-Nigerian. They rescued me from a rather awkward encounter with an older Irish man (fairly common problem in hostel traveling) and we spent the next two days traveling to art museums in the area together. I meant to look them up later when I was back in London, but I never got around to it. Despite the inspiration, I openly confess it was really tough to get the features to look at all ethnically accurate while also being so stylized. I wanted to thank everyone, though I will comment as well, who was so kind as to post Marisole ideas. I definitely think more than a few of them have potential. Every time I get frustrated with this blog, I am reminded of the quality of readers that I am so lucky to have. So, I know I said these would be up last week (or maybe the week before that), but some things came up and I didn’t get around to it. The irony is that I drew this set last year and it’s been sitting on my desktop waiting to be finished for a while. I tried to make sure each page of this set was a consistent color scheme, so that each page can be printed and played with alone, along with combining with the other pieces in the set. I walso wanted to play a little with the options of a magnetic set of paper dolls which are different than the options for a non-magnetic set of paper doll. 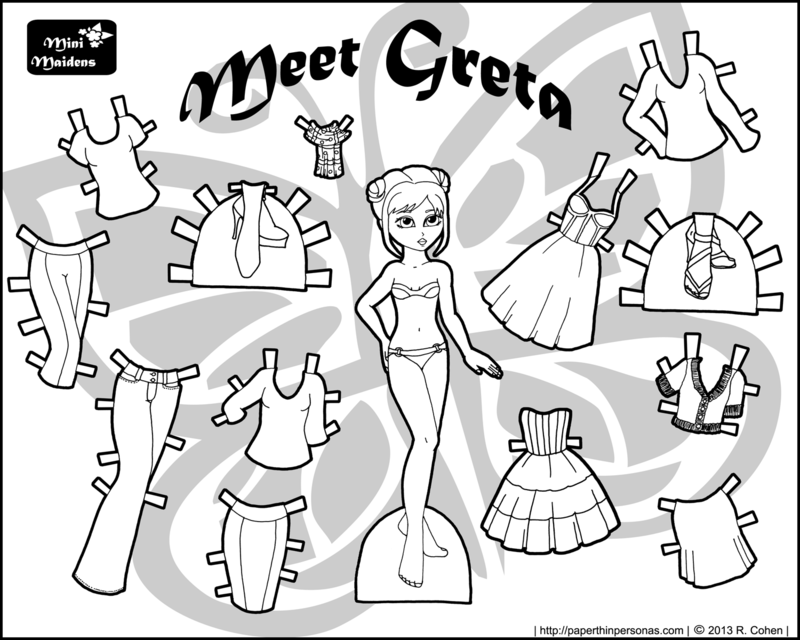 I think magnetic paper dolls have interesting options, but are not the same as paper paper dolls for various reasons. 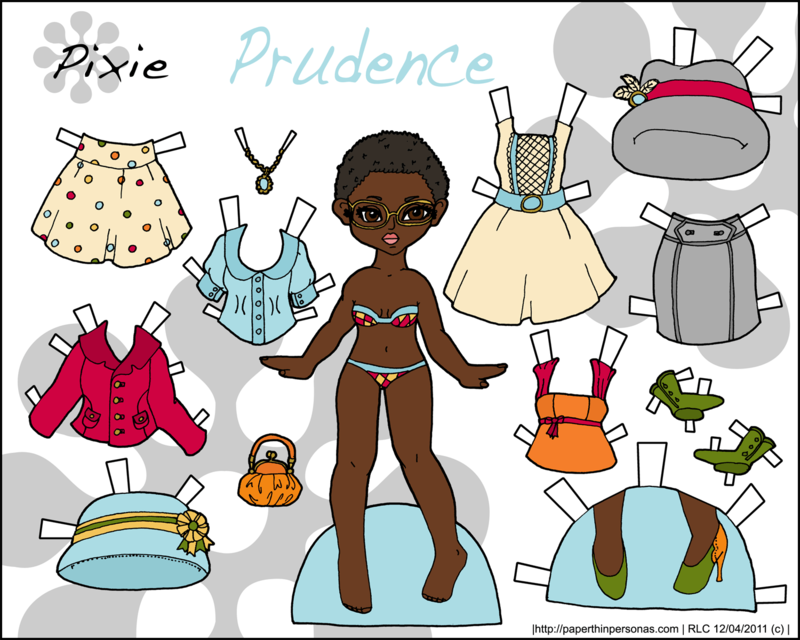 I really am quite pleased with my paper doll Prudence. Her skin tone, like Kadeem’s and Gabriel’s skin tones, was based on my recent searching around for skin tones on the web. After a few weeks of looking and collecting, I have over 50 different swatches, but I am working on narrowing that down to a manageable number- probably 10 to 15. The truth is that a lot of them are so close in color, I don’t think there would be a visible difference once they were printed anyway. 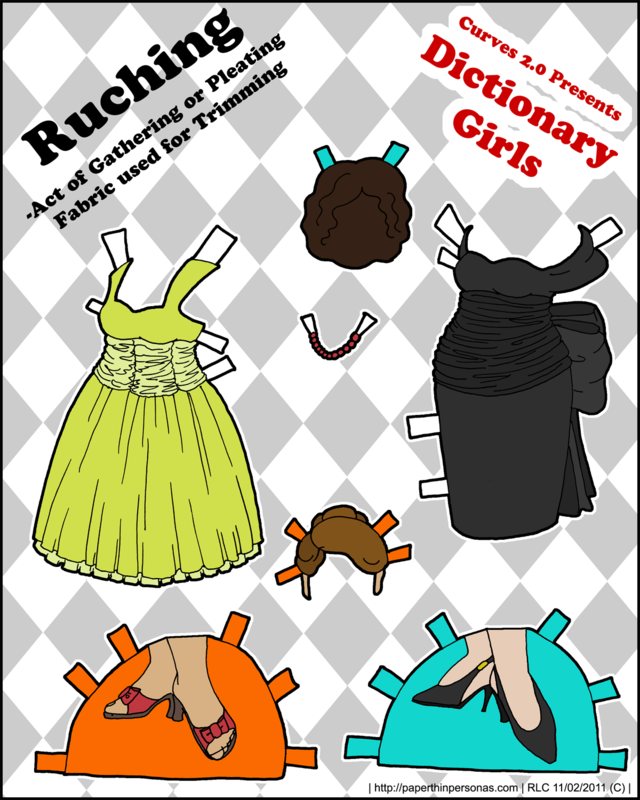 It’s rare I produce a paper doll that I can’t find anything wrong with, but Prudence is pretty close. I lover her glasses and her vintage wardrobe and the color scheme turned out better then I imagined it would. Her hair didn’t come out quite as I had planned it (afro’s are hard to draw), but I’m still pleased with how it looks. Personally, I would pop her into her cream dress and put her on a date with Kadeem or Gabriel for a night on the town. Or maybe slip her into something more fancy and have her strut down the red carpet (I’m sure Roxanne or Yasmine would be happy to share). 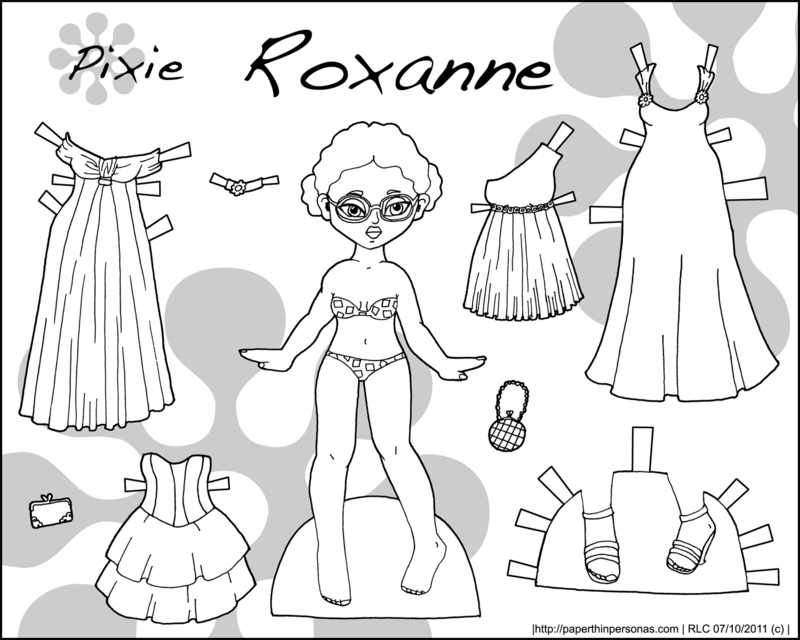 In fact, if you don’t like any of those options, there’s a black and white version of Roxanne and you can color any color dress for Prudence that you think she needs. I’ve never done a black and white Pixie paper doll before, that I recall and I must confess I’m only doing one now because I’m busy and I needed something to post. I felt a little guilty just posting paper dolls I had already posted in black and white, so I did two of them to make myself feel a little less guilty about recycling material. Besides, sometimes the choice is between something or nothing and I’d rather post something. I’ve been terribly busy this weekend prepping for classes that start next week and preparing to travel to Pennsylvania for a wedding. I’ll be out of town for a few days. The blog should post on it’s own without me (assuming I get done what I need to get done to make that happen), but there might be a slight hiatus while I travel. I enjoy weddings, though I was never one of those people who dreamed about my own wedding day. I never caught the “wedding fever” so common to young girls. I did have a wedding Barbie doll, as I recall, but I think she spent most of her time either fighting monsters or going to balls in her pretty white dress.